Very fun as a whole, but the film does showcase some singular hilarious moments for each Simpsons character. I’m still (and probably will be for a while) busting my gut over Homer’s “Spider Pig Song.” There’s something glorious about watching a bald yellow animated man dance a pot-bellied pig across the ceiling, leaving tracks of mud every mother would dread. For The Simpson’s Movie, it’s all about becoming the superhero everyone knew you couldn’t, even if by complete dumb luck. Fluffy, forgettable, and yes, it’s like watching a 90 minute episode, but that has always been fine with me. The virtuoso opening credit sequence of Shane Meadow’s This is England pops with political unrest. Chaotic archival images of skinhead protests, police riots, and the Falklands War rail over the kick back reggae sound of the Maytals, both a jarring and fateful juxtaposition of image and sound. In a nutshell, we see the angry nationalist fervor toward the economic and artistic influence refugees have on the crumbling situation. 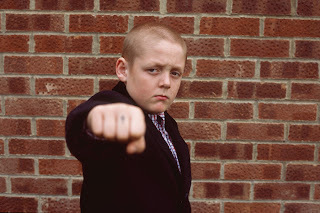 While a devastating commentary on the racial turmoil produced in part by the early 1980’s Thatcher political machine, This is England roots itself in the story of Shaun, a fatherless young boy (his Dad was killed in the Falklands) befriended by a kindred group of skinheads. Meadows plays with our expectations at every turn. Why does this supposed rough crowd take in a bullied youth? What will Shaun’s mother do in response to her son’s transformation? These story questions consistently produce surprising results in the way of perfectly rendered scenes of friendship. Until another outside force, this time in the form of older and more brutal skinhead Combo (Stephen Graham), rips the group of friends apart. Meadows brilliantly shows the affects sensationalism and manipulation can have on the traumatized young mind. At times naively lost and at others downright confidently mean, Shaun spends This is England a muddled reflection of a confused English sense of self and pride. In Meadows’ film, one can spot unsettling foreshadowings of the American home-front post Iraq; the sense of spite for an out of reach democracy, hatred for differing perspectives, and finally a burst of anger spent from years of rationalizing inequality. This is England documents a short and combustible time in the life of Shaun and his native populace, speaking volumes about both in the process. They are connected, they are irreversible, and they are interchangeable, and Shaun’s fractured sense of identity could be a national anthem. Catching up on some key missed films of 2007, so here goes. Waitress is everything I heard it would be – a sweet story, fantastic script, and some delicious mise-en-scene framed around wondrous pies and bright colors. But Keri’s Russell’s brilliant central performance greatly surprised me. At times cringing with agony (she has maybe the worst husband in modern movie history), Russell’s titular waitress Jenna walks like a zombie through a rotten existence, only finding her true calling when pushed to the brink by an unwanted pregnancy. Director Adrienne Shelley’s sparkling film enables a peachy rejuvenation for Jenna and her incredible pie making talents, showing a glow of confidence shine brightly. Purpose seems to be the great theme of Waitress, something that makes up both the company we keep and the lives we live. The sunny denouement sprinkles the final pinch of sugar on top of a joyful independent treat, one fixated on the edible joys of sacrifice and love and the pitfalls of insolence and insecurity.- A sad side note: As many of you might know, director Adrienne Shelly (a great actress in her own right), was murdered last year before the film came out, a devastating loss for the film community. As Shelley’s one and only directorial effort, Waitress feels like a forlorn goodbye to an old, innocent style of filmmaking crushed by the Tarantino’s and Rodriguez’s of the world. Stardust, a rousing if not silly throwback fantasy from Matthew Vaughn, flickers with exuberant bliss while wearing magical trimmings proudly on it’s sleeves. The light hearted mythology of Neil Gaman’s source material gets introduced immediately (smartly via Ian McKellen’s unseen and all knowing narrator), pushing young hero Tristin (Charlie Cox) from the quiet fields of English country life across a stone wall and into the dangerous and astronomical world of murdering princes, falling stars, and decrepit witches. Vaughn uses his actors wonderfully; Clare Danes radiates as a lost constellation, Robert DeNiro snarls and prances as a lightning pirate, and Michelle Pfeiffer wretchedly creeps as an aging sorceress. While the special effects scream for a larger budget, most of Stardust feels perfectly focused on character. No overdone set pieces here, just a worthy catch of medieval and fantastical pastiche willing to go great lengths for the chance to fall head over heals in love. A cold, unsettling artificiality washes over Sidney Lumet’s crime drama Before the Devil Knows Your Dead, infecting every aesthetic stage like a freezing dose of cancerous fate. 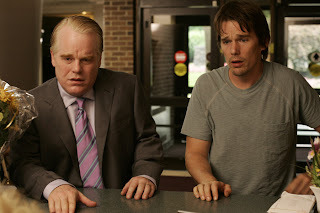 It’s modern day New York City (but not seen through the usual Lumet grit) and The Brothers Hanson (weak deadbeat Ethan Hawk and “strong” accountant Phillip Seymour Hoffman) hatch a plan to rob their own parents small jewelry store for some much needed cash. Both have reasons for the descent into crime (drugs, child support, a future, you get the point), and it’s no surprise when things go badly. After the botched robbery turns into a homicide, tensions begin to swirl, churning under the surface with a sense of anguish that compliments Lumet’s closing walls and stifling psychological spaces. Told in a kind of toned down Tarantino chronology, Before the Devil Knows Your Dead jumps through time in terms of character instead of plot, showing the haunting guilt and building desperation felt as the caper’s aftermath evolves into a devastatingly brutal finale. Lumet, with his sleek blue hues and modern interiors, and editor Tom Swartwout and his fractured sense of time and image, use changing points of view to lay down the biting law of this particular neo-noir world. Affairs, mistrust, egotism, and finally madness overwhelm Lumet’s fateful characters, each seemingly set on a track toward devastation and deterioration. But it’s this very approach, one obsessed with stylized storytelling, which ends up slightly undermining the wonderful all round performances (Albert Finney and Hoffman are especially dynamic). At times, Lumet appears willing to throw subtlety out the window for a smart kick to the teeth, reveling in the pain and suffering a bit too gratuitously, sometimes at the expense of character and pacing. Before the Devil Knows Your Dead might be Lumet’s comeback film, but it doesn’t belong in the canon of his great work. No, it’s just a well made, well performed morality play with an axe to grind and plenty of lives to destroy along the way. A true Christmas joy. Michael Curtiz’s vibrant We’re No Angels creates a perfect cinematic rhythm from it’s theatrical roots, staging cagey dialogue scenes with shades of tropical color and heat. The three convict “Angels”, played by Humphrey Bogart, Aldo Ray, and Peter Ustinov, achieve a beautiful harmonic sync, gliding through scenes effortlessly with the assistance of Ranald MacDougall’s brilliant script. The movie seems to unfold wonderfully without the help of obvious plot points, a sure fire sign of great writing. We’re No Angels might not be as highly regarded as Curtiz’s iconic Casablanca or as epic as his The Adventures of Robin Hood, but it reaches those same great cinematic peaks by slithering into your heart with Holiday compassion and feverish charm, as if you were bitten by the kindest snake in the world (eat your heart out Adolph) and left to enjoy the fuzzy aftereffects.